Legends Tarot is a 78 card deck. 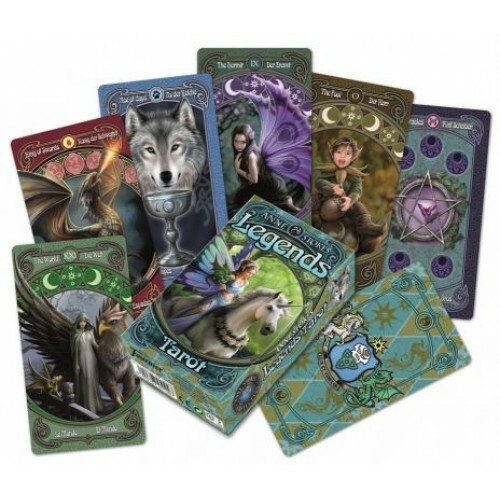 The cards are filled with stunning fantasy artwork with dragons, unicorns, wolves and fairies galore! Born from the union of love and sensuality, the Anne Stokes Legends Tarot opens new doorways to embracing the light while dancing with the dark. The stunning images suggest ancient and powerful wisdom, revealing destiny and releasing fear from the hearts of all who embrace their mysteries. One of the most popular artists in the fantasy genre, Anne Stokes shows us the most delicate and emotional part of the spirit realm. Boxed deck. Cards measure 2.5 inches x 4.5 inches and includes 78 full-colour cards and instruction booklet. All tarot and oracle cards are sold for entertainment purposes only, and no guarantee can be given as to the accuracy of any reading. The user is responsible for his/her own life choices and decisions.